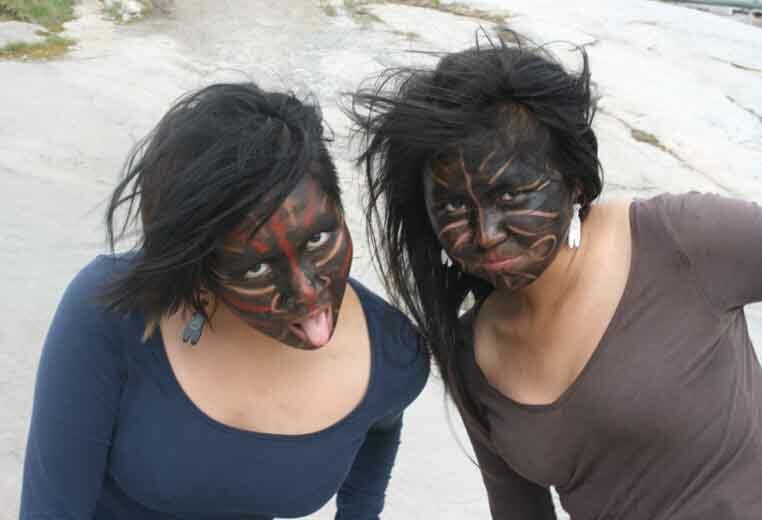 Have you ever been sniffed by the Inuits? 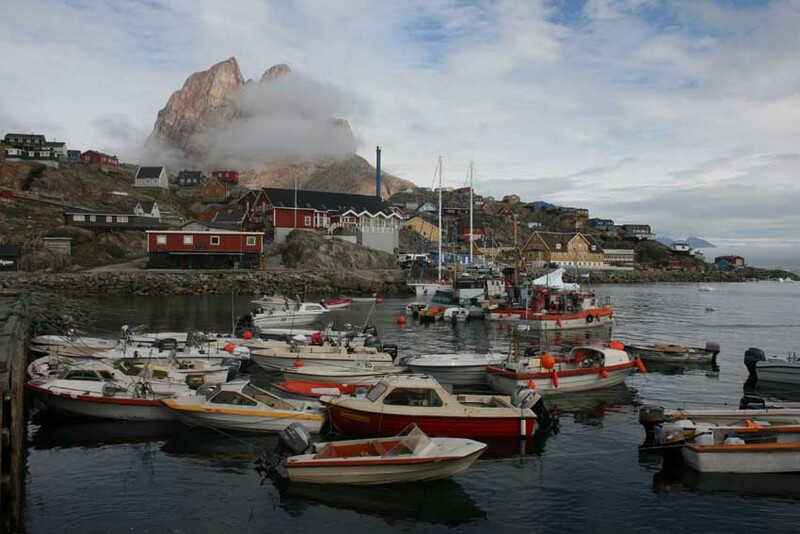 Well if not and you land on the small community of Oqaatusat in western Greenland be ready! I heard the sound of the drum long before I saw the two girls with their painted faces swaying and dancing towards me both welcoming and threatening at the same time. It was the sniffing of my clothing and the protruding tongues that made me feel like some 18th century sea captain stepping ashore on a South Pacific island for the first time. This illusion was instantly shattered when the girls produced a plastic dish full of coins asking payment for their photograph. This to me sums up Greenland quite nicely, a place that hits you with mixed emotions and some of the most magnificent scenery anywhere on Earth. Our trip started with a four hour flight from Copenhagen but Hurtigruten Cruises had chartered the whole plane so 170 of us nestled comfortably in a space normally full with 350. Do try and get a window seat because you fly over the world’s largest island’s ice cap for an hour before you land. For me it was a sight that will live with me forever with mountain peaks rising from the snow like pyramids from the sand and glaciers snaking their way across a barren wilderness. This cruise takes in the Disco Bay area on the west coast. 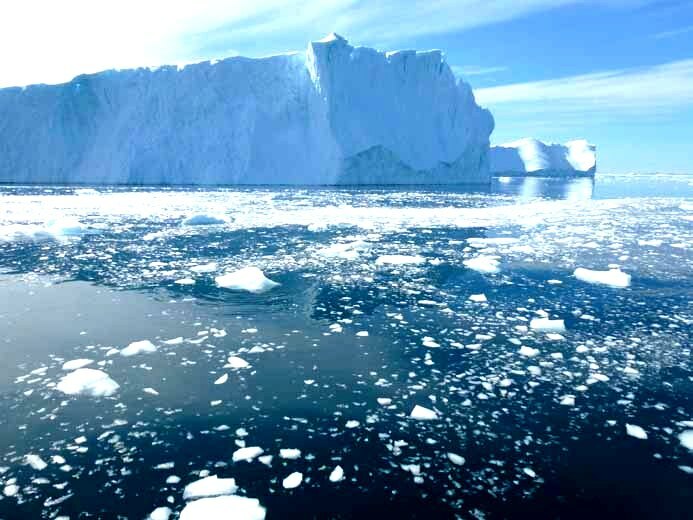 Not only are the icebergs here incredibly beautiful and awe inspiring but the rich waters attract a wealth of wild life. Above the Arctic Circle 24 hour daylight means when I couldn’t sleep I could whale watch and on the first morning I saw a pod of Minkes, others saw a Bowhead whale and distant fins of Orcas plus herds of Greenland and Bearded seals. During the ten days I was on board we travelled as far north as Upanarvik some 360 miles (590 km) above the Arctic Circle visiting ten settlements that varied in size from 3,000 to only 50 people. These visits were made by small boat landing on the shore line or sometimes a jetty so you must be prepared for the possibility of wet feet! 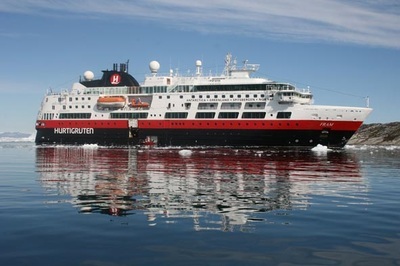 Hurtigruten don’t use zodiacs for their landings but Polar Cirkle boats. As the name implies they are designed specifically for ice work. With high benches for you to sit on they are single hulled ice strengthened boats that can get where zodiacs can’t. A set of detached steps grant you access on to the beach. Their stability is also very important when using it for passenger transport to and from the shore in rough waters. The Disko bay area is the magnet for visitors as it houses the Kangerlua Glacier, the largest glacier outside Antarctica, producing icebergs that can weigh up to 7 million tonnes each. The ice fiord is one of the incredible sites of the world and not to be missed so I took a boat trip whilst some went even better taking the helicopter flights from Illilissat town. These icebergs can shatter into smaller iceflows due to the force from the glacier behind them and cover the sea. Inded I was very apprenhensive as we approached the town with the ship crawling along very slowly pushing and crushing the ice out of the way. She may have an ice strengthend hull for her trips to Antarctica and Svalbard and the Captain and crew are experienced ice sailors but it was still a bit unnerving. 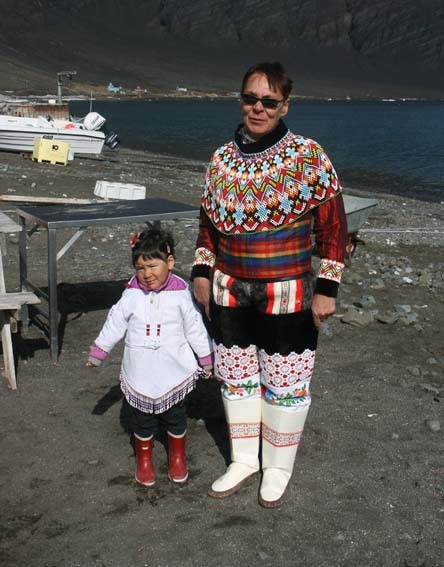 The Greenlandic people themselves are some the friendliest I have met anywhere and they love to laugh and chuckle. I had many a memorable conversation with them in the small communities, neither of us had any idea what the other was saying but we had a great time, playing football with gestures and play acting to make our points! They also gave me a feeling of sadness when I found a cabin that had the skulls of Walrus, Musk Oxen and Narwhal on the porch with vertabrae of seals carved into ornaments. The hunter went inside his house and brought out the photographs of these kills to show me. Not pleasant but I had come to Greenland to see life here for myself not to watch it on a television screen back home. I found I had to have an open mind about hunting and fishing and some of the sites I saw in the smaller communities may well disturb some people. On all our shore landings the expedition team took their rifles in case of encounters with Polar Bears but it was made very clear that we were guests in the bears’ territory and they are shot only as a very last resort after a series of counter measures. To be honest I was more worried about being eaten by the mosquitoes and was glad I had packed the insect repellent and a face net. Remember though that this is adventure cruising, we had to have one trip to a small community cancelled as the sea was so rough we couldn’t land the boats safely. Do not attempt to make a fuss of the sled dogs. They are pack animals and some of them can be very vicious if you get too close. Sea sickness patches are a very good idea, Arctic storms can come out of nowhere. Don’t let that put you off though, Greenland is a fascinating place. I’d go back tomorrow.